Alright. So some people think I'm a cold heated killer because I carry a gun around with me and shoot people with it most of the time. But I'm not just a killer, you know. Oh no. I like to do more than that. I like to dance on occasion too. Heck, if you don't believe me, just watch this 88-minute movie made in 1967; Directed by: Giuseppe Vari; and Starring: George Eastman, Dragomir Bojanic, with Dana Ghia. Now it's not very easy killing a man, is it Ramón (George Eastman)? Although I can more than understand why you attempted to do such a thing, especially after the way Barrett's (Daniele Vargas) thugs stole from you, beat you up, and then burnt your family homestead down with your frail Father still in it. But that's when I came along, isn't it Amigo? Me. Django (Dragomir Bojanic). You're ever-loving over-the-hill gun-for-hire who quickly off-ed your opponents, whilst nursing you back to health in the process. Huh? What's that, Ramón? You want me to teach you how to be more like me? Sure. I can do that. No problem. I have to some time to kill before my next mission comes in, anyway. Still. That's most probably why what next transpires all goes rather loco, when Barrett calls on me to shoot a man dead. As Ghia (Lola) shows her thighs - Barrett receives a nasty surprise - a pupil is betrayed by his teacher - and at the end of the day, an outlaw becomes one hell of a lonely creature. Now at face value 'Django the Last Killer' looks like every other nth rate Spaghetti Western you can think of. Not only does it have a cast comprising of actors living in foreign climes, but it also has your a-typical flimflam camera work complemented with a story-line which doesn't hold much water in retrospect. Take that one scene for instance. That scene where Ramón turns on Django after he's nursed him back to heath and teaches him how to shoot a gun. I mean, what the hell was that all about? Do you know of anyone who'd want to kill someone else after they've helped them in the way I've just mentioned? It doesn't make any sense, does it? Plus it does goes to show how this flick could have been a lot better than it was if the characters involved were a lot more relatable to watch. However, having said that, on the reverse side of this argument, I did enjoy watching those scenes where Django explained to Ramón about the life of the lonely outlaw. 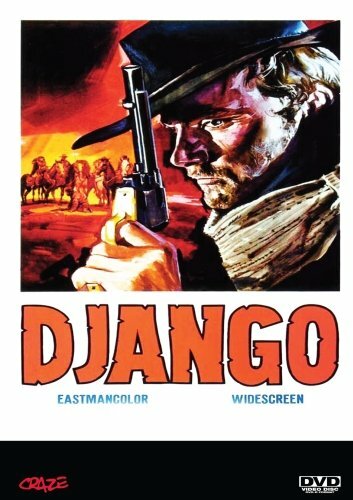 To me, Django was able to convey the minutia of gun-fighting in a very clear and concise manner, whilst spilling a bit of physiological underpinning into the mix in ample measures. Honestly. If the majority of this movie was more like this I would have deemed it a long forgotten classic. As these segments had a charming and engrossing way about them that I personally found very enjoyable and innovative to follow. But hey! You can't win them all, can you? I suppose I was lucky that the great actors involved where able to present these latter scenes in the way they did. Or otherwise I would have been a very unhappy bunny, disappointed with a movie that was nth rate at best, and philandering at worst. Anyway. That's enough of that for the moment, folks. Because I think that this is pretty decent time for some filmic-facts. (1) 'Castor Film' first released this production in Italy on the same day Belgian mercenaries took over the Congolese border town of Bukavu -- the 10th of August, 1967. (2) Loosely translated, this project was entitled 'The Last Matador' in Brazil; 'The Shootist' in Spain; and 'Rocco: I Put about You' in West Germany. (3) One of the main reasons why this film was first screened in Italy was because most of it was shot on location throughout this rather rustic Mediterranean country. (4) The tagline used to promote this picture, was, 'Lessons in death lead to the ultimate showdown'. 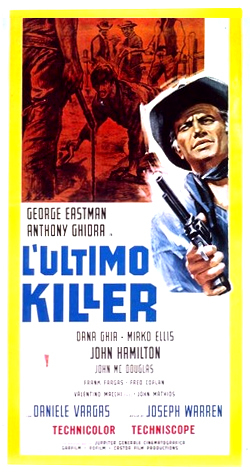 (5) After this flick twirled its last noodle, George Eastman starred in the German Western, 'Un poker di pistole'; Dragomir Bojanic starred in the drama, 'Hole in the Forehead'; and Dana Ghia starred in the Spaghetti Western, 'The Dirty Outlaws'. (6) The director of this film, Giuseppe Vari, directed twenty-eight films throughout his twenty-four years in the business. Regrettably, he passed away on the 1st of October, 1993. 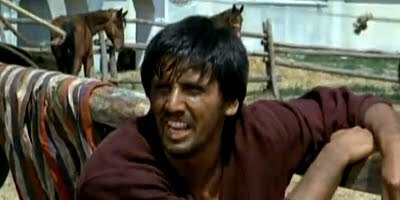 (7) Augusto Caminito, who wrote this Western, has also written Dennis Berry's 2001 thriller, 'Laguna'; Jean-Pierre Mocky's 1978 drama, 'The Witness', plus many-many more I haven't got the time to mention here. Sorry. (8) Originally the makers of this movie wanted to call it 'The Last Gunfighter'. 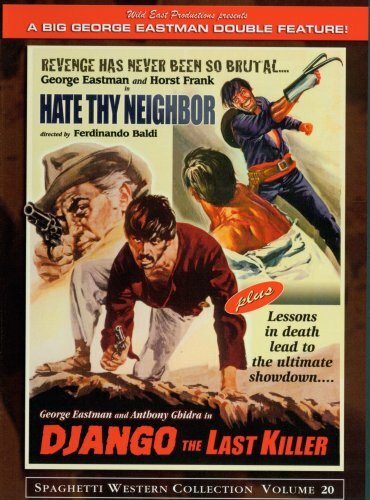 However, after the success of Franco Nero's 1966 Spaghetti Western, 'Django', they eventually come up with the idea of giving it, its current more exploitative title. No. It's not a sequel. OK. So before I fly off to pastures new, I best mention something else about 'Django the Last Killer' I wasn't too sure about. No! Don't get ahead of yourself. My dichotomy has nothing to do with the villains of this piece. Even though they didn't appear visually threatening at all, that's not to say they didn't have a gravitas about them that was kind of menacing by nature. You see, what I wasn't too sure about, largely has to do with the theme tune that sauntered its way throughout this movie. On the one hand it was rather melodious and pleasant on to hear. Whilst on the other hand, it was rather slow and meandering in tone; and this inadvertently bestowed this flick with a melancholy and depressive vibe which should have been more dramatic and vibrant than it was. But then again, as I said previously, you can't win them all, can you pal? And what I got instead was a fairly decent film that was great in places and annoying in others.